BMW Motorrad India will open pre-bookings for the most-awaited motorcycles in India – the BMW G 310 R and the BMW G 310 GS – from 8 June 2018 onwards. 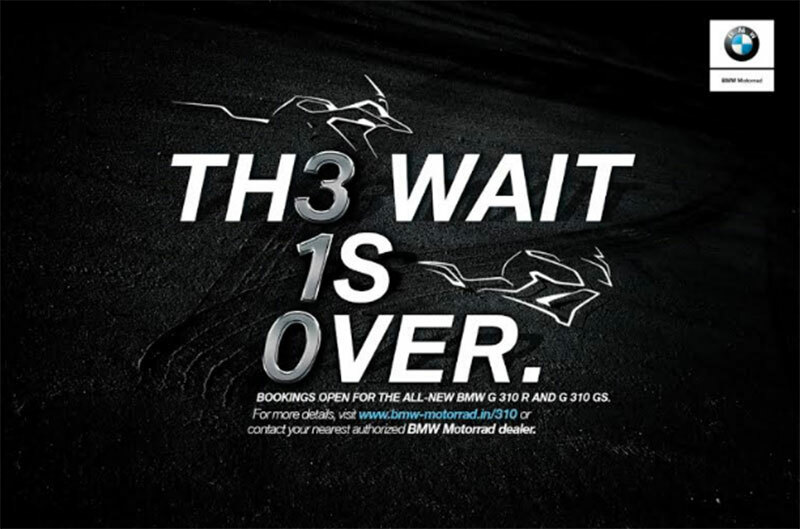 Customers will be able to pre-book the BMW G 310 R and the BMW G 310 GS motorcycles ahead of the official launch for an amount of INR 50,000. Pre-booking can be done at any authorised BMW Motorrad dealership across the country. Deliveries will be done on a first come first serve basis as per orders. BMW Motorrad has a legacy of designing motorcycles that bring together unparalleled riding pleasure, pure performance and assured quality in a unique combination. When BMW Motorrad announced its foray into the sub-500 cc premium segment, it created a stir in the motorcycle industry. With the much-awaited BMW G 310 R and BMW G 310 GS, BMW Motorrad will not only enter but redefine this segment in India. These two motorcycles are built for the Indian roads and offer a true BMW at competitive costs. The wait is now finally over as we open up pre-bookings for our customers ahead of the launch. We are confident that like elsewhere in the world, the BMW G 310 R and the BMW G 310 GS will create a successful chapter in the India story as well. Newly conceived from scratch, the BMW G 310 R represents everything BMW Motorrad stands for: innovation, quality and powerful product substance. Designed specifically for the world market, it takes the typical BMW premium aspiration to the segment under 500 cc. The BMW G 310 R embodies the pure essence of a BMW roadster and offers dynamic performance and comfort, both in town and out in the country. The BMW G 310 GS takes this excitement a step further into the typical GS territory that stands for robust adventures on two wheels. The BMW G 310 GS is a genuine GS: a highly contemporary product with a level of versatility that is currently unrivalled in the segment. Nimble and agile in traffic, yet supremely robust over tough terrain, its agility opens up a whole new world of riding experience. The BMW G 310 R and BMW G 310 GS will be sold and serviced through the premium dealer network of BMW Motorrad that is present across important centres in India including Delhi, Mumbai, Pune, Chennai, Bangalore, Ahmedabad and Kochi. BMW Motorrad’s upcoming dealerships in Chandigarh and Kolkata will start accepting bookings of the motorcycles post launch. To enable customers to own BMW Motorrad motorcyles of their choice, BMW Financial Services India will offer customized and flexible financial solutions. Customers can also get their loans pre-approved before delivery takes place. BMW G310R – What to expect?